I’m pleased that a piece I put together on coaching and physical education has appeared in the most recent edition of American Anthropologist. Entitled, Scaffolding Imitation in Capoeira: Physical Education and Enculturation in an Afro-Brazilian Art, it’s behind a subscription wall (sorry about that). The article is part of my continuing attempt to understand the relation of mirror neurons to actual patterns of imitative cultural learning. The effort is pretty unambitious in comparison to some of the more sweeping declarations about mirror neurons, that they explain all sorts of human capacities. That is, I think some of the discussion of mirror neurons has sped on ahead of both the research and other studies of imitation, including its limitations and odd quirks, to declare that mirror neurons explain all sorts of human abilities. By focusing specifically on a setting where imitation clearly is in play — mimetic learning — I hope to create a model of brain, behaviour, interaction, and even ideology all in interplay to create ability in the individual actor. Mirror neurons alone do not explain humans’ prodigious abilities in imitative learning; the macaques that first offered evidence of mirror neurons to the University of Parma team do not learn well through imitation. So we can’t just explain enculturation through imitation in humans by reference to mirror neurons. There’s got to be more to the story than mirror neurons. So to think about that, I’m looking specifically at motor learning in capoeira, my original ethnographic study, and am now moving to work on rugby coaching (if I can get some research support). What I’m thinking is that this careful neuroanthropological modeling of enculturation will likely undermine certain accounts of what culture itself could be. That is, studying how we get encultured will demonstrate limits on what can be learned, how, and under what circumstances. This is part of my ongoing argument with the late Pierre Bourdieu, especially his almost mystical account of how people get encultured (incorporate a habitus) through imitation. (It’s always easier to argue with dead people, I find.) Bourdieu’s work is enormously important to contemporary anthropology, I believe, and it exercises a positive influence in all kinds of ways on anthropologists’ thinking. But Bourdieu’s model of the habitus is hopelessly impoverished on the level of psychology and inter-subjective descriptions of processes like enculturation for reasons I’ve discussed elsewhere (Beyond Bourdieu’s ‘body’ — giving too much credit?). So this new article is really one of four pieces (for traditional publishing or my ‘day job’) that I’ve written on different dimensions of this whole issue of imitative learning: one on the theoretical implications is still under review , one that focused more on the neural mechanics got shot down so I’m revising it, and the last on the methodological implications for apprenticeship-based research is still in preparation (and I’m working with a couple of other authors on that one). If someone is just mad keen on imitative learning and enculturation theory in physical education, I’d be happy to share the other pieces, but I’m not so confident of them that I’m just going to let them loose on the world til they’ve been through a thorough review process. Imitation plays a crucial role in apprenticeship in the Afro-Brazilian performance genre capoeira, as in many skills across cultures. 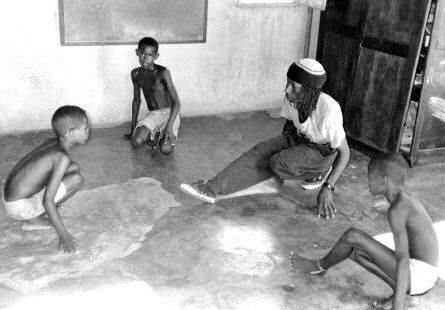 In this article, I examine the interactional dynamics of imitative pedagogy in capoeira to better understand physical education as a form of bodily enculturation. The ability to learn through imitation is widely considered a hallmark of our species. Imitative ability, however, is a social accomplishment rather than a capacity of the learner in isolation. Human models often provide assistance to novices seeking to imitate, including a variety of forms of what educational theorists call “scaffolding,” which are astutely structured to a novice’s ability, perceptions, and even neurology. Scaffolding techniques vary. I here examine how instructors reduce students’ degrees of movement freedom, reorient their model in perceptual space, and parse complex sequences into component gestures. Close analysis of pedagogical interaction highlights the divergence between forms of instruction and practical skills being taught. So using the concept of ‘scaffolding,’ inspired by the cultural learning work of Lev Vygotsky (although he never used the term, many see it as emerging from his work), I try to think about the parts of the system outside the organism itself that facilitate learning through mirror neurons and imitation. I think that the article as a whole makes a case, however successfully, for thinking about imitative learning in physical education as a socially embedded neurophysical process. We imitate well because we have these learning niches where we imitate structured by other people, ‘more knowledgeable others’ in Vygotsky’s terms. We imitate well because we facilitate each other’s imitation. Lots of things about this interest me, but one of the most important is that instruction itself is a skill, even imitative instruction. I think a lot of theories of enculturation just assume that people become encultured by copying competent action. But when we look at settings where they learn skill, skilled actors do all kinds of special things to teach novices how to do skills. We know this is the case with classroom-type education, but I think we ignore it too much in relation to physical skills. If it’s the case that learning is structured in this way (another example is baby talk), then the idea that people just become encultured through a kind of osmotic copying starts to look less and less probable. Cultural transmission usually demands more than just cultural performance. If we allow that cultural performance demands some additional pedagogical component to get passed on, we introduce a stage where all sorts of modifications can enter the transmission of culture. Although I’m really pleased that the piece has been published in American Anthropologist, I do still have a few reservations or concerns. The first is that ‘physical education’ is virtually invisible in cultural anthropology in spite of the fact that ’embodied learning’ is a frequent theoretical device for explaining all sorts of things. I worry that by focusing on sport, dance and physical education, it will not be clear to a wide readership that the issues involved are actually central to anthropological theory, especially as so much of contemporary theory is based upon ideas about ‘practice’ and ‘habit,’ as Stephen P. Turner has argued (and criticized very effectively, as in Brains/Practices/Relativism and Social Theory as a Cognitive Neuroscience). If the kinds of imitative learning that contemporary theory suggests are possible don’t occur in physical education or language learning, where do they occur? The second concern I have is with what I dropped from the article to get it published. I dropped a lot of the neurosciences-influenced discussion, saving it for a separate article that got shot down (although, admittedly, I need to rework that piece and try to publish it again). In other words, I turned in a less radical version of the article than I might have and still faced some reluctance from the reviewers about using any discussion of brain science research. I don’t know how deep this reluctance went; would it have gotten published if I had resisted any attempts to diminish the discussion? Who knows. I wasn’t gutsy enough to push hard on this as I needed the publication for careerist reasons. I found that same reluctance on a recent grant application; reviewers suggested that combining biological and cultural accounts was perhaps over-ambitious. This reluctance to theorize in the presence of biological data strikes me as odd, especially when the ethnographic data is similarly focused on individual-level processes. That is, using person-centered data on an appropriate scale, why is it any more preposterous to think about biological processes than to think about macrosocial, political-scale processes? If I were looking at individual learning and making reference to the world economy or the history of slavery in Brazil or something similarly grand scale, I’m not sure that my anthropological colleagues would be so reluctant to let me draw certain connections. Don’t get me wrong; I tend to be pretty clear that the links I wish to draw between biological processes and observable cultural phenomena are conjectural. I tend to hedge like crazy. And yet I still find that anthropologists are more uncomfortable with logical leaps to biology than to theoretical moves to some pretty hard-to-observe large-scale phenomena, even when the original ethnographic data is much closer in scale to organic biology than to political-economy. What resulted is a piece that readers of this weblog might find unnecessarily cautious. I didn’t delve into a lot of the discussion of neurosciences that I would here, but a fair bit of that was self censorship. I feel like I need to carefully, piece by piece, push slowly into thinking about the brain in the pieces I seek to publish in journals in my field. Maybe that’s why I enjoy this weblog so much; I get to write what I think rather than simply allude to it or put a couple of paragraphs of brain-related theory in a long article, hoping that reviewers will let a small sin slide by their vigilance. So this is a bit of an apology at the same time that it’s self promotion. I’m sorry that the article is not bolder, but please keep checking in. I’ll try to be more and more neuroanthropological in my ‘day job’ as I build up my oeuvre in the field. Turner, Stephen. 2002. Brains/Practices/Relativism: Social Theory after Cognitive Science. Chicago: University of Chicago Press.